If you thought the last book ended with an emotional rollercoaster, wait until you start this one. You won’t be able to put it down (because I know I didn’t). I read this book in one sitting (semi thankful that it was only around 200 pages) and I don’t regret a thing. I needed to know what happened with Travis, Charlotte, and Porter. There is just not the big thing to worry about, but also this underlying problem that always makes an appearance when you least expect it. Porter, oh man, I never really considered myself to attach to men in books and call them ‘book boyfriends’ but this man certainly makes a compelling case. Throughout the whole ordeal, he never gave up hope on Charlotte and optimism with the whole thing. He is romantic, caring, smart, funny, and stopped at nothing to get Charlotte and Travis in his life, despite the efforts of Brady. I loved Charlotte’s struggle between the darkness and the light. She wanted many times to fall back into the darkness (when there are struggles with Travis and Porter) but she stays in the light because she CHOOSES to. I love that she fights back not just against Brady, but against the other family members in her family that always tell her what to do. It’s easier to stand up to bullies you don’t like, but to stand up to ones that you love, that is a whole other level of difficulty. Aly Martinez has a way of writing gripping and harrowing tales that touch on sensitive subjects that can happen to someone. This story is tragic on so many levels and there are so many innocent victims that were effected by one person’s decision so many years earlier. It’s a gripping, heartbreaking emotional ride that leaves you wanting more. And I for one definitely wanted more. I felt the same kind of emotions that the characters felt in each of those big moments in the story. There is a HEA for the characters in this story so it’s good to know that. It’s nice to know that I can walk away from this story and know that they will be ok. Though if Aly Martinez wanted to write more about them I wouldn’t complain. 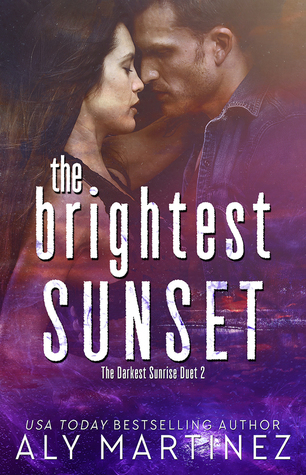 This entry was posted in Books and tagged Aly Martinez, Inkslinger PR, The Brightest Sunset, The Darkest Sunrise Duet.